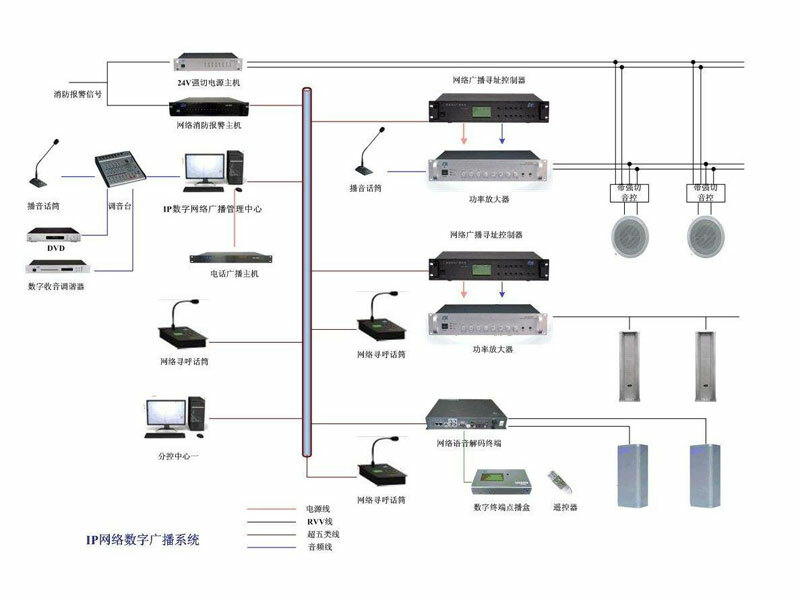 ﻿ Characteristics and Advantages of IP Public Broadcasting System - Guangzhou DSPPA Audio Co., Ltd.
Digital IP network broadcasting system adopts TCP/IP network technology which is widely used in the world today. Audio signals are transmitted in LAN and WAN in the form of IP packet protocol. The problems of distance limitation, poor sound quality, complex maintenance and management, and poor interaction performance of traditional broadcasting system are thoroughly solved. The equipment of the system is simple to use and easy to install and expand. A powerful digital broadcasting system can be constructed by connecting digital broadcasting terminals to computer networks. 1. Ordinary power amplifier: large power loss, if used for a long time, easy to lose electronic components, so the failure rate is high, and power consumption is large. 3. Ordinary network terminal + ordinary power amplifier: There are few input and output interfaces of ordinary terminal sound source, which may cause the difficulty of local direct input of other sound sources without input interface. Only common network broadcasting functions can be realized with ordinary power amplifier. 4. Network front-end + energy-saving power amplifier: Multi-channel audio source input and output, easy access to local multi-channel audio source, it can play the local required sound source at any time, with energy-saving power amplifier can achieve the commonly used network broadcasting and automatic broadcasting functions. 5. Common network power amplifier: Volume knob of common function, easy to produce noise and damage, without strong cut signal, high power consumption, etc. 6. Intelligent network power amplifier: adjusting the volume by digital signal, it is not easy to produce noise or silence, it has strong signal output, can linkage fire protection, it has all the functions of energy-saving power amplifier.